For the series of games, see Age of Sail (video game). 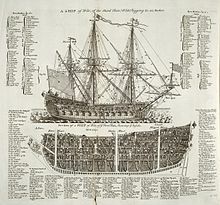 The Age of Sail (usually dated as 1571–1862) was a period roughly corresponding to the early modern period in which international trade and naval warfare were dominated by sailing ships, lasting from the mid-16th to the mid-19th century. Like most periodic eras the definition is inexact but instead serves as a general description. The age of sail runs roughly from the Battle of Lepanto in 1571, the last significant engagement in which oar-propelled galleys played a major role, to the Battle of Hampton Roads in 1862, in which the steam-powered ironclad CSS Virginia destroyed the sailing ships USS Cumberland and USS Congress, demonstrating that the advance of steam power had rendered sail power in warfare obsolete. The Suez Canal, in the Middle-East, which opened in 1869, was impractical for sailing ships, and made steamboats faster on the European-Asian sea route. The period between 1850 and the early 20th century when sailing vessels reached their peak of size and complexity is sometimes referred to as the "Golden Age of Sail". During this time the efficiency and use of commercial sailing vessels was at its peak—immediately before steamboats started to take trade away from sail. By 1873, the Age of Sail had definitely ended, with HMS Devastation (1871), commissioned in 1871. HMS Devastation was the first class of ocean-going battleships that did not carry sails. Sailing vessels were pushed into narrower and narrower economic niches and gradually disappeared from commercial trade. Today, sailing vessels are only economically viable for small scale coastal fishing, along with recreational uses such as yachting and passenger sail excursion ships. ^ "The Age of Sail". HMS Trincomalee. Archived from the original on 2016-03-16. Retrieved 12 April 2016.